FRAMED PRINT. 22x18 inch (56x46cm) Framed Print with Black Satin with Off-White Digital Mat. Artwork depicting GHOST DELIVERS WARNING. A spectral figure materialises in a candlelit room where two men are roused from their books. The older man points ahead while the ghost points upwards. A ghostly warning?. Shipping from USA. 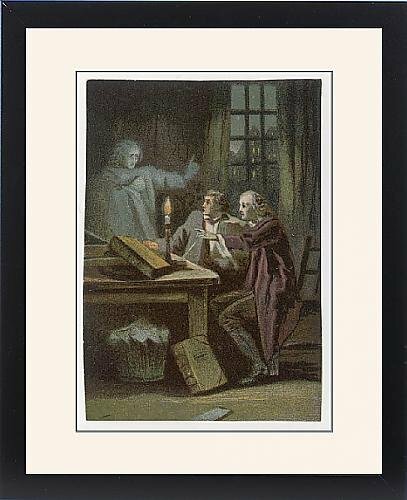 Artwork Description... A spectral figure materialises in a candlelit room where two men are roused from their books. The older man points ahead while the ghost points upwards. A ghostly warning?.